Harmar Highlander residential vertical platform lift is a safe, smooth and economical solution to the barriers porches and other elevation changes can create in and around a home. Highlander vertical platform lift is designed from the ground up to be as cost-efficient as possible. Highlander platform lift is available in heights from 4 to 6 feet. The Highlander is built to accommodate most residential applications with ease. 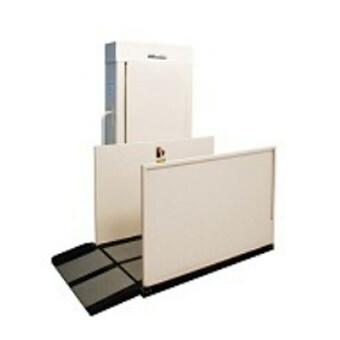 Highlander platform lift is simple to install, easy to operate and virtually maintenance-free for use indoors and out. Lifting height 53” to 77"